1989 was a vintage year. Not only did it give the world Tim Burton's Batman and Ghostbusters II, it saw the release of the Sega Genesis and Game Boy in North America. 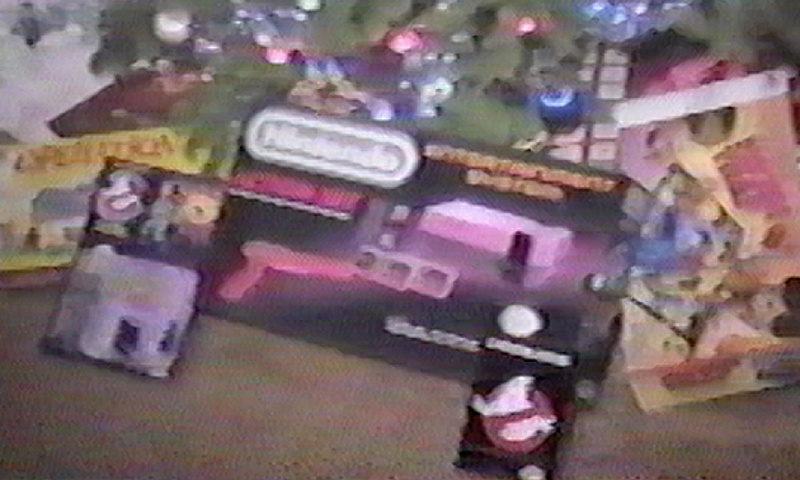 It was also a big year for iretrogamer.com founder and occassional Nintendo Life contributor Tyler Esposito - then a 3-year-old Ghostbusters fanatic - because Christmas gave him his first Nintendo Entertainment System. As ever, his late father recorded the whole event, and Esposito has shared the video with us just in time for Christmas. If you're a child of the '80s then you're certain to spot something you recognise - from the Operation and Mouse Trap board games to the Batwing from Burton's aforementioned Batman. Perhaps you connect more strongly with the Real Ghostbusters Egon figure (RIP, Harold Ramis) or the short-lived Police Academy toys? Whatever speaks to you, we're decided on one thing: we sure wish Christmas looked like this now. That was great to watch,brought back a lot of memories.I was of the era of Star Wars.He-man and Thundercats.Loved the Police Academy movies,never knew there was toys for them though,they weren't exactly kids movies.I had Operation but never did get Mousetrap even though I wanted it,I'm sure one of my cousins had it. @Damo I never knew about that.1989 was around Count Duckula time.I watched all the cartoons back then.Shame it never made it over,I would have enjoyed it haha. That was a nice nostalgia trip. My brother and I had the NES, the bat wing and mouse trap. We were also big fans of Ghostbusters and Turtles. They were the big toy crazes at Christmas. I wish I had some recorded memories like that. I still remember when my brother got his Master System in the early 90s, and we went to an independent record store in town a few days after Christmas that also sold video games. They were hung on the wall by the little plastic hoops on the top of the case, and each had a grade in letter form that determined how much it'd be. Also I miss the days when things aimed at adults got action figures and cartoon shows aimed at kids. Robocop comes to mind there. More of a reaction to Mouse Trap than to the NES and GB stuff! Did it bother anyone else that none of the presents were wrapped?? I have to say I really miss that excitement as a kid opening up presents. It's an excitement unlike any other and you only really experience it for maybe 12-13 years. I can't even be bothered using the step up composite cable, NES games just don't look like right with it. Anyways, such a great mom! I wish I had more video footage of when I was 5 & 6 in the late 80's, nothing Christmas related unfortunately, just mostly B-day, Disney land and camping footage! What can I say, Video cameras weren't exactly the norm back then! All these did you remember comments make me feel young, I was only born in 1998! 17 now. I agree. wrapping the presents Is a must. Leaving everything as is destroys a large chunk of that excitement. Kind of unusual, since wrapping is part of the Christmas tradition. @HawkeyeWii haha, yup! Who doesn't wrap presents? Also, I felt pretty jealous at all the rad stuff that kid got. My Christmases were significantly less rewarding in the gift department. Unfortunately, I got NES games on my B-day, but rarely every Christmas, it was devoted mostly to toys and board games. However, I did have a crazy sega genesis Christmas though back in 91', but looking back it would of been 10x more magical had it been the SNES. Awesome video man seeing you're happy little face all lit up magical, 80's was an excellent time too grow as a kid. @123akis And that comment makes me feel old! Turned 30 this year! Nostalgia overload with this video! Another great video, Tyler! Your parents are so awesome for having filmed all of this. I recall only one holiday that the entire early morning festivities in my home were filmed in entirety, so it's always a joy to watch several of yours, likewise. This video in particular reminds me of some awesome toys I barely remember, including that Rescue Heroes figure I had hoped for. @HawkeyeWii I think that's because those were from Santa, who usually doesn't wrap the presents you ask for (at least not in my house, either). It was just more exciting to see all that big stuff right away when you ran out into the living room on that glorious morn. Christmas in 1989? I was only seven months and eleven days old by then!